When I warp using my sectional beam, I've always used painter's tape to hold each section in place while I wind the others, but I've often been disappointed in how easily and quickly it rolls up and "un-sticks" itself. After every section, I push the tape back into place, but by the time the next section is wound, there are tape curls everywhere. This time I decided to try something different after dealing with this issue for several sections of this towel warp. You know those hook-and-loop straps that can be purchased almost anywhere, the ones that are meant to be used to wrangle loose wires? Well, the ones that I have are just the right size to close around each 2-inch section after it's wound. You do have to keep each one open with your fingers as you wind, or they stick like crazy to the yarn, but the soft, non-sticky side slides easily into place. Not a bad fix, if I do say so myself. I'm sure I'm not the first person to come up with this fix, but hey, I'm happy to share! 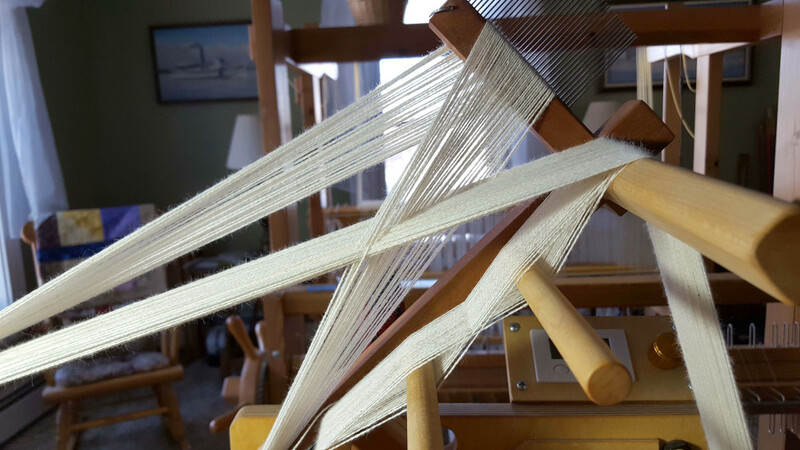 Weavers often find themselves playing a charming little game called "warp chicken" towards the end of their warp. 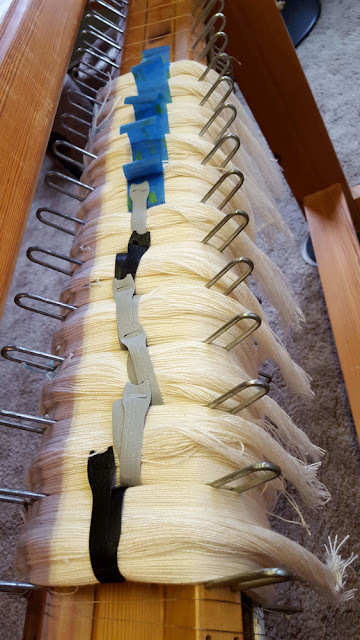 As the weaving reaches the end of the warp, just how much more weaving can be squeezed in before the end of the warp is at the furthest shaft and there is no way to weave anymore through a very small to non-existent shed. I played a different version as I wound this warp. My very large cone of ringspun 8/2 cotton was dwindling down quickly, and I had very little left with two sections to measure. I weighed the cone, and got 6.46 ounces, but didn't have the weight of the cardboard cone itself. I then warped the next to last section, weighed the cone again and got 3.85, meaning that I used 2.61 ounces of yarn. Without the critical piece of information I needed, i.e. 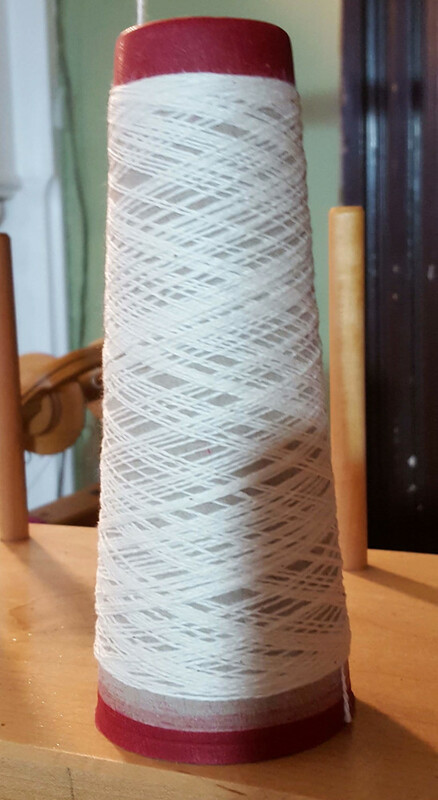 the weight of a bare cone, I decided to try it and hope I would have enough yarn. I placed an order for a replacement cone, then started measuring, glancing nervously at the quickly depleting cone as I went. Remember, this is an 11.5 yard warp. This is what was left when I was done. What a relief! Plenty of cone showing through there. I might have been able to measure out one or two more ends at the most. Oy. It's back to work after my accounting "holiday," so there will be larger bits of time between accomplishments. Just glad that I could finish warping the loom, at least! I've played that game of "warp chicken" more than once! My goal is to finish the weft repeat and have no yarn left on that cone.